NASA revealed this morning (AEST) that its Van Allen Probes have discovered a third, previously unknown, radiation belt around Earth. The belt appears to be transient, depending strongly on solar activity. The Probes mission is part of NASA’s Living With a Star geospace program to explore the fundamental processes that operate throughout the solar system, in particular those that generate hazardous space weather effects near Earth and phenomena that could affect solar system exploration. In what could perhaps be described as serendipitous, scientists had switched on key instruments on the the twin probes (which are described in detail in the second video below) just three days after launch from Cape Canaveral Air Force Station in Florida on August 30 last year. Within days of launch, the Van Allen Probes kicked a major goal. That decision was made in order that observations would overlap with those of another mission, the Solar, Anomalous, and Magnetospheric Particle Explorer (SAMPEX) – launched in 1992 – that was about to de-orbit and re-enter Earth’s atmosphere. In practice it meant NASA’s mission scientists gathered data on the third radiation belt for four weeks before a shock-wave from the sun annihilated it. 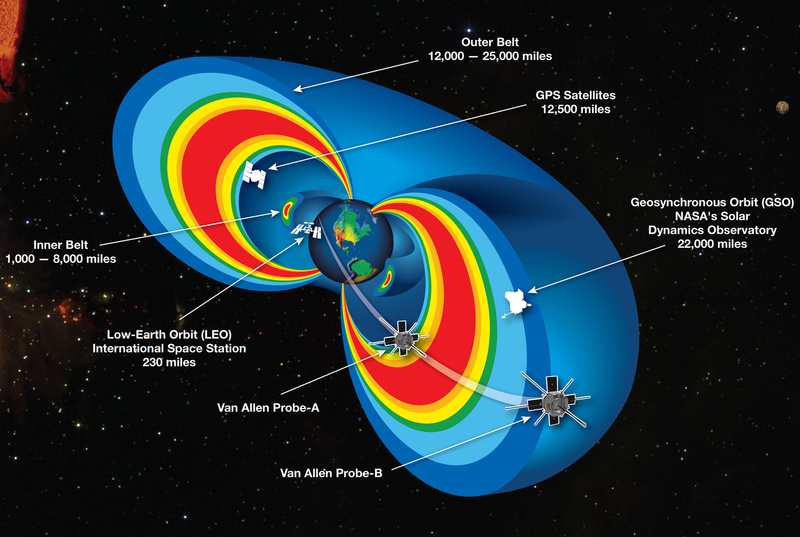 The Van Allen Probes are studying an extreme and dynamic regions of space known as the Van Allen Radiation Belts. These belts are critical regions of space for modern society. They are affected by solar storms and space weather and can change dramatically. They can pose dangers to communication and GPS satellites as well as humans in space – as I’ll discuss shortly. Named after their discoverer, the late pioneering NASA astrophysicist James Van Allen, these concentric, donut shaped rings are filled with high-energy particles that gyrate, bounce, and drift through a region extending to 65,000 kilometres from the earth’s surface. The probes’ discovery was a first for the space age. Data from the USA’s first satellites, Explorer 1 and Explorer 3, discovered the inner radiation belt in 1958. Under the hoods of the Van Allen Probes. This belt is comprised mostly of high-energy protons, trapped within about 600-6,000 kilometres of Earth’s surface. 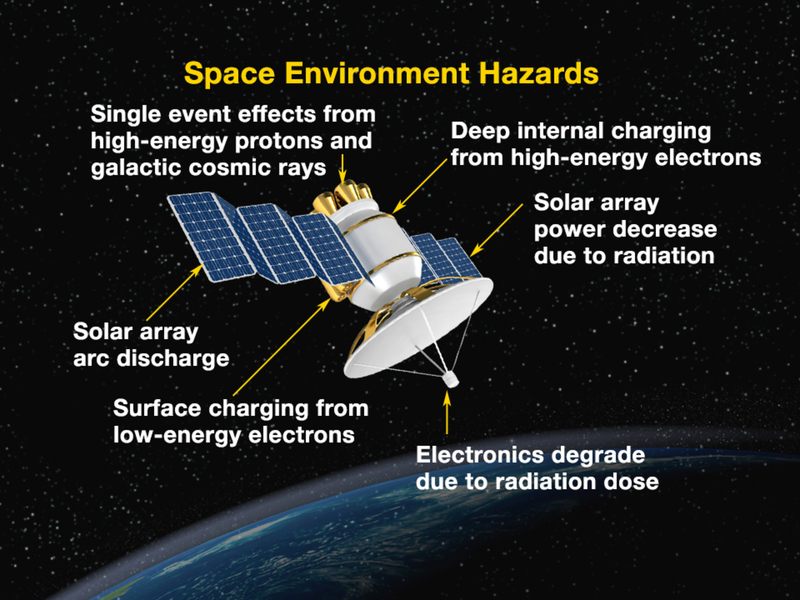 Those particles are particularly damaging to satellites and humans in space. The International Space Station (ISS) orbits below this belt at 330-410 kilometres. The second radiation belt was also discovered in 1958 using instruments designed and built by James Van Allen that were launched on Pioneer 3 and Explorer IV. This larger belt is located 10,000 to 65,000 kilometres above Earth’s surface, and is at its most intense between 14,500 and 19,000 kilometres above Earth. The second belt is much more variable than the inner one. In addition to protons, it contains ions of oxygen and helium. So what of the third belt? This new, outer zone is comprised mainly of high-energy electrons and very energetic positive ions (mostly protons). As reported today in the journal Science, this torus formed on September 2 last year and persisted unchanged in a height range of 20,000-23,000 kilometres for four weeks. It was then disrupted by a shock-wave from the sun. A cut-away model of the radiation belts with the Van Allen Space Probes flying through them. The radiation belts are part of a much larger space weather system driven by energy and material that erupt off the sun’s surface and fill the entire solar system. Besides emitting a continuous stream of plasma called the solar wind, the sun periodically releases billions of tons of matter in what are called coronal mass ejections. These immense clouds of material, when directed towards Earth, can cause large magnetic storms in the space environment around Earth, the magnetosphere and the upper atmosphere. The term space weather generally refers to conditions on the sun, in the solar wind, and within Earth’s magnetosphere, ionosphere and thermosphere that can influence the performance and reliability of space-borne and ground-based technological systems and can endanger human life or health. Most spacecraft in Earth orbit operate partly or entirely within the radiation belts. During periods of intense space weather, the density of particles within the belts increases, making it more likely that a shuttle’s sensitive electronics will be hit by a charged particle. Ions striking satellites can overwhelm sensors, damage solar cells, and degrade wiring and other equipment. When conditions get especially rough in the radiation belts, satellites often switch to a safe mode to protect their systems. When high-energy particles – those moving with enough energy to knock electrons out of atoms – collide with human tissue, they alter the chemical bonds between the molecules that make up the tissue’s cells. Sometimes the damage is too great for a cell to repair and it no longer functions properly. Damage to DNA within cells may even lead to cancer – causing mutations. During geomagnetic storms, the increased density and energy of particles trapped in the radiation belts means a greater chance that an astronaut will be hit by a damaging particle. That’s why the ISS has increased shielding around crew quarters, and why NASA carefully monitors each astronaut’s radiation exposure throughout his or her career. The advances in technology and detection made by NASA in this mission already have had an almost immediate impact on both basic science and the space-based technology we all depend on.